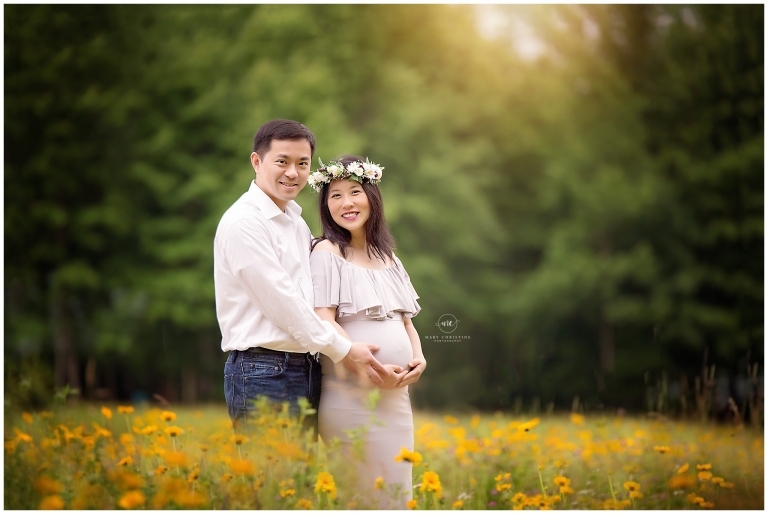 Welcome Amy’s pregnancy photos to the blog! My goodness, what an adorable little bump and couple! This little one is going to be not only cute as a button, but well loved as well! Amy came for her pregnancy photos at thirty weeks pregnant. She was looking for some studio silhouettes as well as some outdoor photos. Since we live on a farm and the studio is here as well, it served as the perfect location for both! I love the variety that we were able to get using outdoor locations as well as studio. I love the look of our wild flower field in this set. Amy’s adorable bump and floral crow tip this one into one of my all time favorites! Of course the gown from Sew Trendy Accessories is my new favorite as well. This boho look is very in trend right now! Simple studio maternity photos are my go to shots for pregnancy sessions. I love how simple and elegant they are and how it draws your attention right where you want it- to momma’s sweet miracle growing inside of her. Pregnancy really is an amazing thing and I love celebrating this special time with my clients! These two are going to be the best parents! I loved meeting them and feeling their excitement and they get ready to welcome their little one into the world! Thank you so much for stopping by the blog! Are you expecting a little one soon and are looking for some pregnancy photos to document this special time in your life? Please check out the blog on what to look for in a newborn photographer and documenting your pregnancy. If you like what you see on the blog and portfolio, please contact me today to chat about your session.